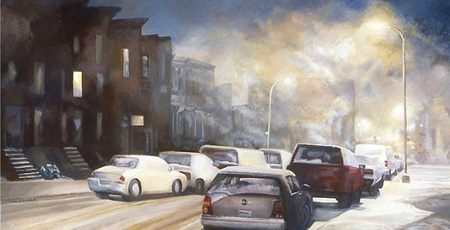 Familiar but strange, beautiful but forlorn, peaceful or foreboding (depending on your frame of mind) Brooklyn-based Tom Keough's oil paintings of New York at night – dynamic contrasts of shadows and light – have almost no people in them. If you do see a person, they're sure to be alone, probably seen only from the back and trudging through the snow. In that sense, he out-Hoppers Hopper. There will be an exhibition of Mr. Keough's work at the Hal Bromm Gallery, 90 W. Bway [Chambers] 212.732.6196, beginning April 23rd and a preview reception on April 22nd from 6pm-8pm. You can also purchase prints of some of the pieces, from $50-$400, depending on size and paper. He also has a poster of The Sycamore for $10. MUG is delighted to have a new weekly series – courtesy of the skint, a terrific daily listing of free and cheap things to buy, see and do in New York.